"Happy Valentine's Day! A friend gave me this for Valentine's Day. Thought I'd share with my Pug Crew :) http://viannechocolat.com/2010/08/organic-pug-bars-66-percent-cacao/"
"Just got one of these for Valentine's Day from my best friend. SO CUTE! 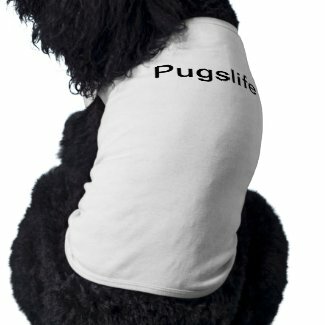 Thought I'd share :) http://viannechocolat.com/2010/08/organic-pug-bars-66-percent-cacao/"
"HAPPY VALENTINE'S DAY! Hope you and your pugs are having a wonderful one :) Pug Chocolate bars...just in time! http://viannechocolat.com/2010/08/organic-pug-bars-66-percent-cacao/ "
"That might actually work....I'll give some of the other things a try too... I think this bedside baby crib/cot thing may do the trick! I'll price some out and let you know.... "
"One of my friend's googled me the other day and read my post on this site! Ironic, No? " "It's bad enough when you go onto Google Earth and find the house in glorious colour sporting a for sale sign that came down a year ago. It doesn't affect me but if it did I would want to know." "Hektor and I are very happy to be you and Fudgy's friends. Helena and Hektor"
"Thanks! I hope that more people check it out and do it! It had info on me going back over 8 years...my addresses...even street views of my house. YIKES!" "Hi Juno, I used to sleep with my dog, many years ago before I had even contemplated getting married. When we got the first Pug, our Henry, we put him in the Kitchen which was just across the hall from our bedroom and when we got his nephew he went…"
"Hi juno i got the request but it came up withdrawl as i don't know why but,i can't accept unless it comes up as accept on my end hope we can figure this out enjoy your day." "Good Heaven's that is just terrible, you have done a good thing here to tell people about it's existence." Quirky, Cute Indie Rock Chick. Fudgy is super smart! He likes to eat and LOVES to fart. A friend of mine passed this along today. Thought I'd share it with you all. I checked it out and it's completely true. IT'S SO CREEPY! Hi juno i got the request but it came up withdrawl as i don't know why but,i can't accept unless it comes up as accept on my end hope we can figure this out enjoy your day. Really glad you liked the list and that I might introduce you to a few great new groups / songs and vise versa. Will look forward to yours -- whenever you have time to do it. Great... Hope you got my lists. zzy was dropped off in a box at the Hollywood pet boutique / rescue center called Spot! After just a year and a half in business, they are doing an average of one adoption a day! Izzy's brother was with her. They haven't seen each other since she was adopted first back on June 29. Now, an opportunity to attend a Valentine's events planned by the Hollywood Pug Group from meetup.com may bring them together for the first time again. Hope so. Max is experiencing some anxiety, as Izzy has grown larger than he is... and she's often overly playful. He's now on anti-anxiety meds. She's on a flower formula to not be as agressive around her friends. Izzy's medication is mostly for those teeth. Her sutures come out tomorrow or Friday the latest. So, she's almost back to "normal." Hope Zoey is doing well -- and thanks for asking. I see the video is above, I'm going to see it tomorrow after a very, very long day working. Glad you've posted it. We want your girl to be well! I'd love to send you a list of the indies I like out this way -- and elsewhere. Likely this evening, since I'll be home then. I'd love a list of your favorites, too. No offense taken, its just a pug trait, they just tend to bug out, and I guess its more noticeable since she's very petite. Although they can easily get scratched because they do stick out pretty far. Just be sure your vet is well informed on pugs, as a lot of vets aren't very familiar with them.